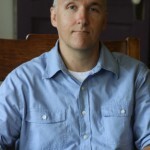 Chris Green, author of three Mayapple Press titles, Résumé, Epiphany School and The Sky Over Walgreens will read at The Dollhouse Reading Series #36 on Saturday the 8th. The event starts at 7:30 pm (doors at 7pm) and admission is free. BYOB! Chris will read from Résumé and newer works too.